Sheikh Mohammad Abdullah’s letter to Chaudhary Noor Hussain, (Chairman of Defense Committee for Sheikh Mohammad Abdullah), which Sheikh sahib wrote while in incarceration in 1960, is particularly relevant in the wake of the failed Indo-Pak NSA talks and would be of interest to serious students of the history and politics of Jammu and Kashmir. Needless to say, the letter was duly censored by the Superintendent of the Special Jail. I understand the compulsions, the geopolitical realities, and the context within which certain political decisions were made in 1947. Unfortunately, those compulsions and political realities often get overlooked in official historiographies of India and Pakistan. Even his staunchest critics would be hard-pressed to deny that Sheikh Mohammad Abdullah was the architect of the economic and political emancipation of Kashmir. By evoking the moral consciousness of a nation, he appealed to the best in human nature. History has borne witness to the inability of several stalwarts to achieve their ideals, because they took rigid and inflexible stands. In order to achieve the larger objective, they have had to make compromises, sometimes unpalatable ones. In August 1955, a group comprising eight legislators from the Constituent Assembly initiated a political movement called the J & K Plebiscite Front. The first president of this organization was Abdullah’s trusted colleague, Mirza Afzal Beg. Beg spearheaded this movement during his probationary period. The credo of the Plebiscite Front was “self-determination through a plebiscite under UN auspices, withdrawal of the armed forces of both nations from Kashmir, and restoration of civil liberties and free elections” (Dasgupta 1968: 227–28). The “seditious” goals of this organization unleashed state-sponsored violence against its members and supporters, creating a repressive atmosphere that was meant to insidiously gnaw at any semblance of autonomy that J & K retained. In 1956 the Constituent Assembly validated a draft constitution for the state, built on the premise that the state of J & K was and, indubitably, would remain an integral part of the Union of India. This unambiguous premise assigned the political inclinations of the people of Kashmir to an obscure position. In fact Nehru unabashedly declared that the legality of the accession of Kashmir to India was now a moot issue. Theisundemocratic approach did not go unchallenged, and Sheikh Mohammad Abdullah wrote protest letters from prison to his former ally Nehru, and to his former trusted political comrade G.M. Sadiq, the pro-communist speaker of the Assembly. Despite his incarceration, Abdullah’s larger-than-life political status and clout, reified by his die-hard supporters, kept alive the issues of self-determination and special status. When the draft constitution was placed before the house, Mirza Afzal Beg moved a motion of adjournment for exactly two weeks, in order to enable Abdullah to be present. The Assembly was presided over by Sadiq who ruled the motion out of order. Subsequently, Beg and his followers protested and boycotted the proceedings (Dasgupta 2002: 97). The large-scale repressive measures deployed by the government of India paved the way for it to firmly entrench the state’s new constitution on 26 January 1957. This development was followed by a resolution of the UN Security Council, which reiterated that the final status of J & K would be settled in accordance with the wishes of the people of the state as expressed in a democratic plebiscite. In effect, the convening of a Constituent Assembly as recommended by the general council of the All Jammu & Kashmir NC would not determine, in any way, shape or form, the political future of the state. The course of the political destiny of J & K would be charted by the voice of its people raised at a democratic forum under the auspices of the UN (ibid. : 408). The resolution affirmed that the Kashmir issue was still pending final settlement and, despite claims to the contrary by Nehru’s Congress government, was under consideration by the Security Council. The reiteration of earlier UN resolutions regarding the Kashmir issue made explicit the disputed status of the state. However, the UN was unable to retard or prevent certain political developments in J & K.
Soon after validating the new constitution, the Constituent Assembly dissolved itself and sought the organization of mid-term elections in order to constitute a new Legislative Assembly. At the time, the jurisdiction of the Election Commission of India did not extend to J & K. Although the election that was held in June of 1957 had a semblance of political equity, Abdullah’s bête noir and a politician whose notoriety was by then unsurpassed, Bakshi Ghulam Mohammad, won his seat without any contest. Bose (2003: 75) makes some interesting observations about the mockery of the electoral process in the state that year, in which Bakshi Ghulam Mohammad’s NC won 66 seats. Electoral contests of dubious authenticity occurred for only 28 seats. In brazen disregard of democratic processes, of 43 Kashmir Valley seats, 35 were won by official NC candidates without even the semblance of a contest; 30 NC candidates, including Bakshi, won overwhelming victories without an iota of opposition; and another 10 NC candidates were elected after the nomination papers filed by opposing candidates were invalidated. Not surprisingly, the official responsible for vetting the nomination papers was an unscrupulous Bakshi adherent, Abdul Khaleq. In the Jammu region, there was a contest of sorts for 20 of the 30 seats – the NC won 14 seats, the Praja Parishad bagged 5, and a party representing ‘low-caste’ Hindus secured 1 seat. The organization of a well-manipulated electoral process had enabled New Delhi to ensure the victory of the stooge faction that it patronized. Bakshi Ghulam Mohammad, who had been elected as the leader of the NC legislative party without dispute, was reinstalled as prime minister. Bakshi and his cohorts were firmly entrenched not just in the Legislative Assembly, but in the Legislative Council as well. The monopolization of both houses of the Assembly by a political faction sponsored by New Delhi legitimized a full-scale intervention of the central government, allowing the incorporation of non-Kashmiri officials in important administrative positions and the subsequent marginalization of the well-educated segments of Kashmiri Muslims. The Pandit population of the Valley, which was a small minority, enjoyed privileges in the political, civil and economic structures of which the Muslim majority was deprived. During these fateful years in the history of Kashmir, a wide fissure was created within the ruling clique when Bakshi, in his signature style, did not incorporate any members of the Communist faction headed by G.M. Sadiq into the cabinet that he formed subsequent to the 1957 elections. Bakshi’s inability or unwillingness to appease this faction motivated Sadiq to create a separate organization, the Democratic National Conference, with the rebel Communist group of fifteen legislators. New Delhi recognized the threat that the rebelliousness of this faction could cause not just to the constructed political stability within the state, but also to India’s relationship with China which was already on the decline. The Chinese government had ratified an agreement with the military regime in Pakistan which specified that after the Kashmir dispute between the governments of Pakistan and India had been settled, the pre-eminent authority concerned would initiate negotiations with the government of the People’s Republic of China in order to implement a boundary treaty to replace the present agreement. It reinforced its alliance with Pakistan’s military regime by underlining that if that supreme and indisputable authority was Pakistan, then the provisions of the present agreement would be reinforced (Dasgupta 1968: 389–91). The prospect of the Pakistan – China alliance being bolstered spurred New Delhi to bring about a rapprochement between Bakshi’s and Sadiq’s warring factions in 1960. Sadiq and his cohort were reincorporated into the cabinet. A couple of years after this reconciliation, in 1962, Assembly elections were held in the state, and Bakshi and his cabinet colleagues Sadiq, Mir Qasim and Khwaja Shamsuddin won their Assembly seats without even a peep of opposition (Bose 2003: 78). That year elections were held to 60 seats in the entire state, out of which the Bakshi-led NC suspiciously won 55; the Praja Parishad won 3 (telephonic conversation with Sheikh Nazir Ahmad, late General Secretary of the NC, 8 January 2009). Bakshi’s arrogance, and rampant deployment of corrupt and illegal methods and malpractices in political processes, soon caused him to be an embarrassment for the “democratic” government of the Republic of India, and his mentors in New Delhi had to ask him to step down from the position of prime minister of the state; Bakshi resigned in November 1963. The political bigwigs in New Delhi were concerned that another unopposed election in the state would tarnish India’s reputation as the largest democratic republic. So Nehru’s unsolicited advice to Bakshi was that he would gain more credibility and the elections could boast of an air of fairness if he lost a few seats to ‘bona fide opponents’. 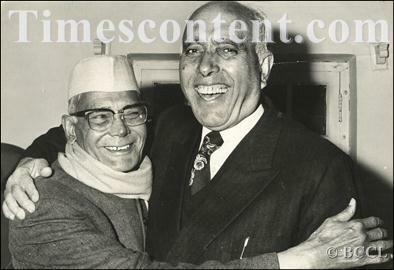 Bakshi’s political indebtedness to Nehru and his clique prevented him from discounting Nehru’s advice, and he was replaced as prime minister by a hitherto unknown political entity, Khwaja Shamsuddin. Although the new government was headed by Shamsuddin, Bakshi’s political clout buoyed by his practices of his goons remained a formidable presence. Consequently, his political rival who enjoyed the patronage of the same political forces that had enabled Bakshi’s ascendancy was not accommodated in the new government (Puri 1995: 45–49). I would like to believe that my opinions have evolved during the course of my research. And, in all honesty, I find Sheikh Mohammad Abdullah’s politics relevant even today. He, like the rest of us, had his flaws and shortcomings, but that doesn’t take away from his commitment to Kashmir. I believe, without a shred of doubt, that in civilized societies, political dissent is not curbed and national integrity is not maintained by military interventions. I have said this earlier on other public platforms. I reiterate that the more military officials get involved in issues of politics, governance, and national interest, the more blurred the line between national interest and hawkish national security becomes. The welfare of the people of the state can be guaranteed by securing the goodwill of the political establishments of both India and Pakistan, and by the display of military discipline and efficiency at the borders. Thanks to my research and productive interactions with people who understand Kashmir, I make these assertions with an earned confidence. I have brought up this idea in my presentation at a couple of conferences, and I reinforce that perhaps it is time to seriously consider a new regional order which would be capable of producing cross-economic, political, and cultural interests among the people of the region. I have received your letter of January, 1960, which was brought here by Mr. Abdul Rahman. He also had an interview with me and Beg Sahib, the other day. We have thus had a broad account of your organization in the United Kingdom. Naturally, all of us are grateful for your solicitude for the cause of Kashmiris, and for what the organization is reported to be doing to sponsor that cause. In fact it is a common cause and, as you rightly say, all of us must march in step. You are aware of our people’s struggle for freedom carried on through the last three decades. Destiny left it to me to spear-head that struggle through suffering and sacrifices, in which particularly people of the Valley, Poonch and Mirpur, had the major share. It has been my proud privilege to suffer with my people and for them. Nothing can be a nobler and higher aim of human life than a dedication to the cause of emancipation of an enslaved and down-trodden people. When a cause is noble and great it calls for commensurate sacrifices, and those wedded to it have to offer them ungrudgingly. Ever since 1931, when the national movement was launched, our ideal has been a right of self-determination for the people of the State, and to that end I am contributing my humble bit. The present is just a stage in that struggle. This right of self-determination of a people is no new slogan, much less is it a novel demand. It is a universally recognized right, and is the anchor-sheet of the United Nations’ Charter. Every civilized nation in the world endorses it unreservedly for every subjugated people. In fact, its denial in word or deed has always led to devastating wars and manslaughter of millions. Its sanctity and gravity cannot, therefore, be exaggerated. Yet, Kashmiri people are today suffering incalculable hardships for the achievement of this right, otherwise conceded to every nation. But as a soldier in struggle for a noble cause, I have no grouse against the suffering. Every objective has a price to be to be paid for. With the dawn of freedom in this subcontinent, unfortunately the question of Kashmir was hung on, and for the last twelve years it has bedeviled the Indo-Pakistan relations. In the process of wrangling, the State has got artificially partitioned, which has crippled the social and economic life, and also paralyzed the political advancement on either side of the cease-fire line. Thus economically, politically, and socially it is a disrupted State whose development in any sphere has been rendered impossible. When the Kashmir accession issue went to the Security Council, India reiterated her plebiscite pledge, and Pakistan fell in line. Thus not only both the countries of India and Pakistan but the world organization as well held that the only solution to the problem was to concede the right of self-determination to the people of Jammu and Kashmir State through an impartial plebiscite to be held under United Nations auspices. Unfortunately, India and Pakistan got bogged down into minor details of plebiscite arrangements. And this has led to the miseries of 4 million people of the State. For the last twelve years the gulf between India and Pakistan has widened, and in the process the people of Kashmir have been crushed in every conceivable manner. As you rightly say, ‘The Kashmiri people are left bereft of all human dignity, democracy, and the much spoken of basic human rights.’ And what is their ‘Crime’ —other than the demand for the right of self-determination—a right repeatedly promised to them, and to the world at large, both by India and Pakistan. They are barely asking for the implementation of these promises. In return—and how tragic it is—they have received bullets and ruthless repression, long sordid years of incarceration and other inhuman tortures. I, as the spearhead of their movement, have been under detention for nearly seven years now (excluding a brief period of four months in early 1958), and a large number of my colleagues are going through years of incarceration. It is difficult to describe what suffering our people outside are facing. But, as I have said, no objective can be achieved without paying the price. Whatever our lot in this tragic struggle may be, we should never harbor any bitterness. Fortunately, there is none in my mind against anyone. Bitterness contaminates the cause, warps the mind, and distorts the vision. Those who espouse a noble cause must avoid bitterness at any cost. We owe it to our conscience and to the cause. Moreover, against whom should one be bitter? After all we are a part and parcel of the subcontinent. Our peace and prosperity is inextricable wedded with the peace and prosperity of the millions in India and Pakistan. In spite of the physical delineation of the boundaries, we all live in one zone. Our hopes, aspirations, fears, and dangers are the same. In the happiness and prosperity of India and Pakistan lies the peace and prosperity of the people of our State. It would not be too much to say that, God forbid, if India and Pakistan go down, Kashmir cannot survive. You would appreciate, I hope, that as long as Indo-Pakistan relations remain strained, not only will the solution of the Kashmir question recede further and further into the background, but even the peace in the subcontinent hang by a thin thread. Such a situation is obviously fraught with disastrous consequences not only for India and Pakistan but even for the whole of Asia. Kashmir is a tiny speck which may be wiped out of existence any moment. Thus we must look at this question in the broad perspective and urge a settlement accordingly. In the friendly relations of India and Pakistan lies the future of our State. We want a lasting and peaceful settlement of the question, reflecting the wishes of the people. Therein lies honor, peace, and progress for all concerned. As for the case going on against us, the commitment proceedings have taken too long, and the end is not yet in sight. It may be two or three months hence when the trail actually begins. My colleagues end you their best regards. We are all well. Convey my regards to your colleagues. This entry was posted on Tuesday, September 8th, 2015 at 00:05	and is filed under Uncategorized. You can follow any responses to this entry through the RSS 2.0 feed. Both comments and pings are currently closed.